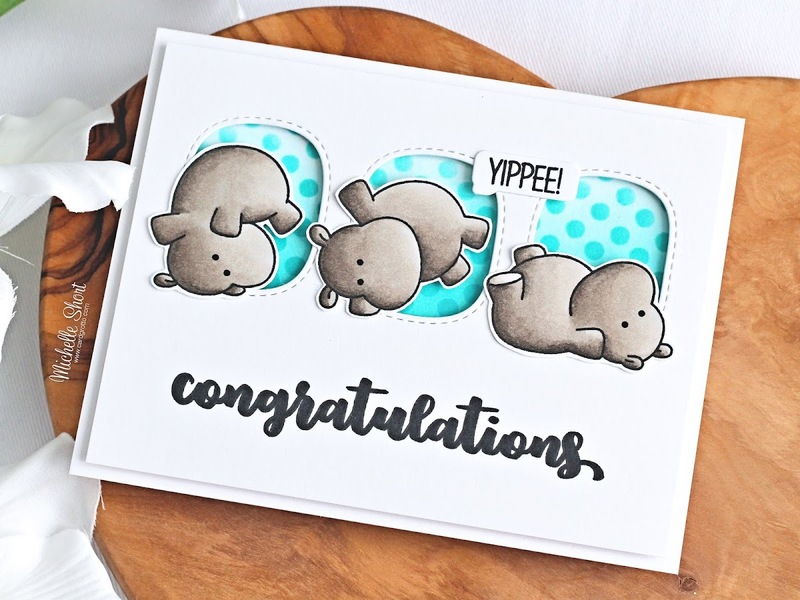 The Card Grotto: Clearly Besotted Teasers | Yippee! Clearly Besotted Teasers | Yippee! Hello there and welcome to day three of the December Clearly Besotted Teasers. Today I am using the new super cute Head Over Heels set. Yes, the hippos are back and this time, they are doing summersaults! This set is great for Valentine's but I think you can use it all year round as well. 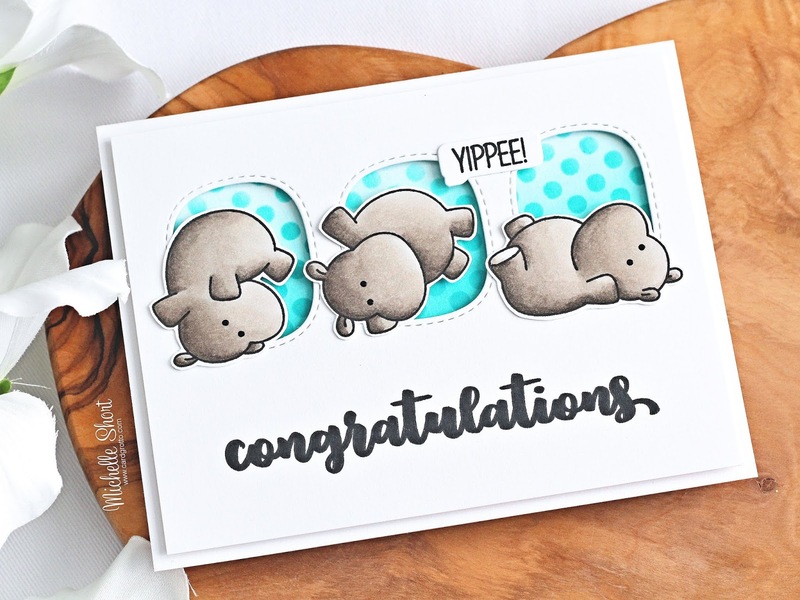 I started off by stamping the three hippos in the Head Over Heels set on to white cardstock with Memento Tuxedo Black ink. I coloured them with Copic Markers (the colours that I used are listed below the supplies section) and then fussy cut them out, but there will be coordinating dies available. 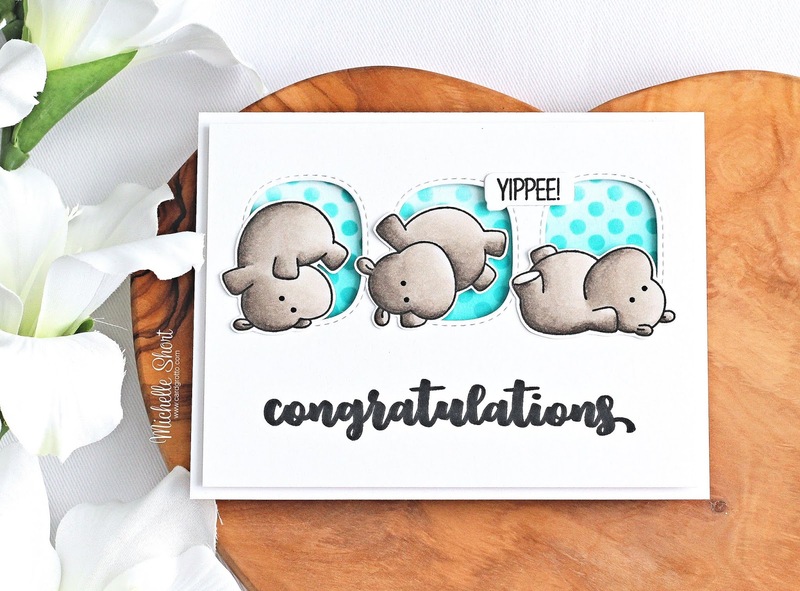 I also stamped the 'yippee!' sentiment and die cut this out with one of the speech bubbles from the You Said It Die Collection. I took a panel of white cardstock and die cut this using the MFT Stitched Triple Peek-a-Boo Window Die. I then stamped the 'congratulations' sentiment below from the Occasion Calligraphy set, with Memento Tuxedo Black Ink. I took an A2 white card base and masked off the edges. I blended on Distress Oxide Ink in Peacock Feathers first, concentrating most of the colour at the bottom. I then placed over the Basic Spots II Stencil and blended over more ink. The masks were removed and then the panel added on top with foam tape. I added on the hippos and speech bubble with a combination of foam tape and tape runner. To finish off, I added black glaze pen to the hippo's eyes. 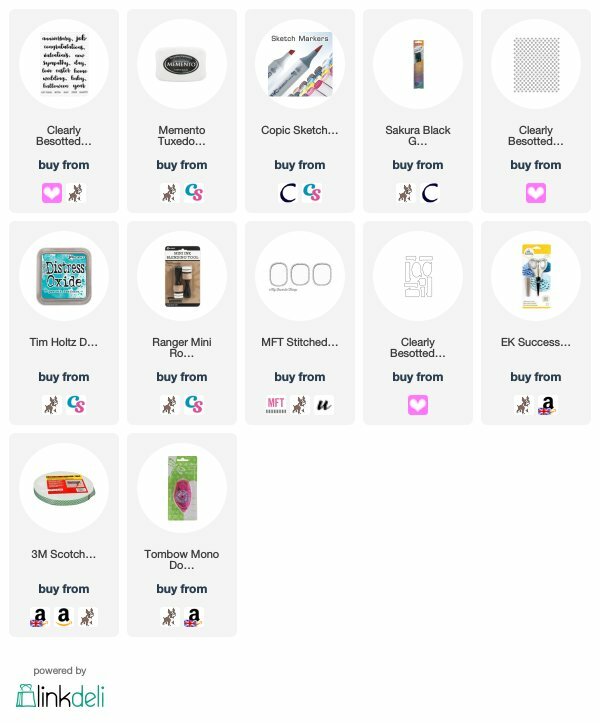 Here are the links to what I have used on the card. Affiliate links are used on some products. This means that if you make a purchase after clicking on my link, I receive a small commission with no extra cost to you. I truly appreciate your support when using these links. Please click on the logo below the product to shop at your favourite store. Products marked with an asterisk (*) were kindly sent to me to use. COPIC MARKERS: W7, W5, W3, W2, W1, W0. Aren't these guys just so cute? I love them! I do apologise for the quality of my photos. If you live in the UK, you will understand. We are getting one day of sun a week here and it is proving very difficult to take photos, sadly. Please do check to see what my teamies Stephanie, Keren and Lisa have been up to. See you tomorrow for day four. Thank you so much for visiting me today, I really do appreciate it. Have a great day! Super cute card! The hippos are just adorable! Those guys are so CUTE. omg! so super fun and cute!! Amazing creativity Michelle. Fun colours, great effect with those spots & amazing colouring as always. Love it. Thank you for inspiring.